From school drop off to date night, the WYO-HORSE jewelry collection is designed for horse lovers, equestrians, and the woman who loves modern southwestern style with a Boho flair. This mixed-metal finish bracelet is a fun everyday piece with a curated, vintage feel. Pair it with jeans and boots for a classic Western look, or wear it to add a little edge and color to dressier outfits. It's a not-too-thick conversation piece that also pairs beautifully with bangles and mixed metals for the layered look. This bracelet makes a fun gift for birthday, Mother's Day, Christmas or Valentine's Day, for a mom, wife, girlfriend, or favorite aunt who does a little gunslinging on the side. 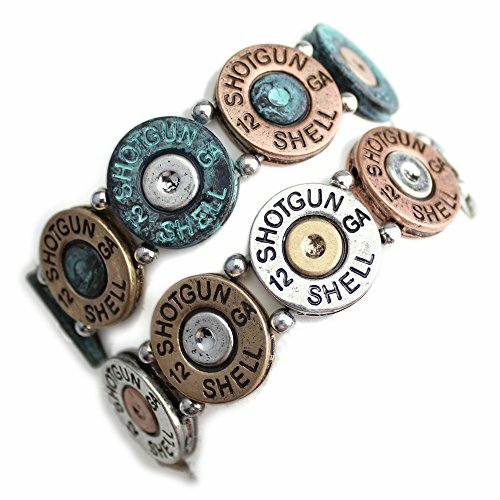 STRETCH ALLOY SHOTGUN SHELL BRACELET WITH MIXED METAL and PATINA FINISHES. This bracelet measures approximately 1 inch across and stretches to slip on and fit comfortably on almost every wrist. Nine faux 12-gauge shotgun shells are strung together to wrap around the wrist with copper-, silver- and copper-patina-toned finishes. SHOTGUNS AND STILETTOS. Whether she spends time at the local shooting range or just likes her jewelry a little edgy with a touch of western chic-this shotgun shell bracelet is made for her. If you have any questions about this product by Wyo-Horse, contact us by completing and submitting the form below. If you are looking for a specif part number, please include it with your message.